This show is included in a 7 DVD package, by Green Frog. This program is also sold separately. Steam in the 50’s. is the first of a three volume series. Jerry Carson was another of the classic era cinematographers. 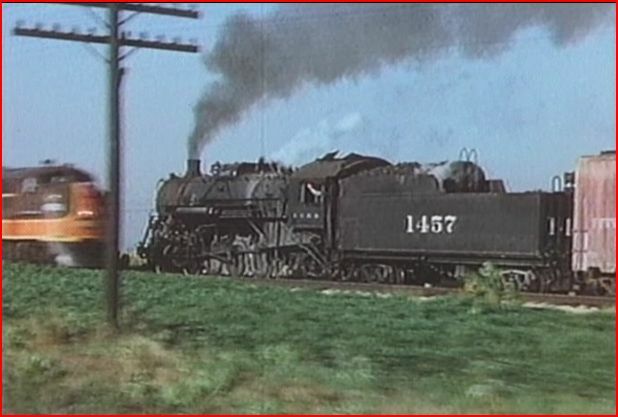 In this extraordinary collection of films, we will view 14 railroads. Filmed in the 1950’s, many of these scenes, are of high quality. There are 14 different railroads covered in this exceptional collection of steam. 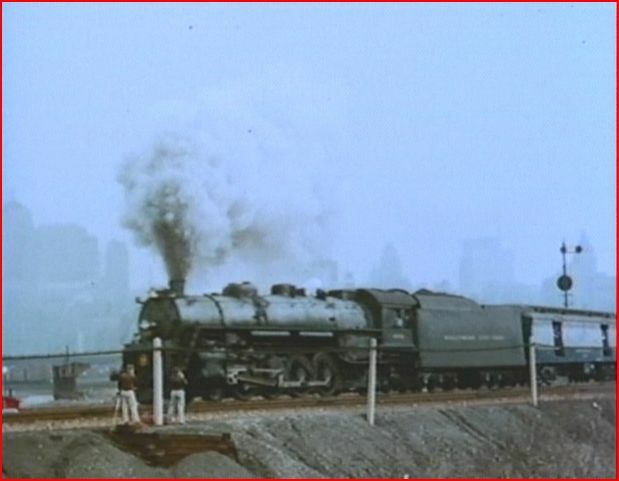 They include: Chicago & Northwestern, Canadian National, Canadian Pacific,Missouri Pacific, Erie, Chicago & Illinois Midland, Pennsylvania Railroad, Northern Pacific, Grand Trunk, Illinois Central, Baltimore & Ohio, Norfolk & Western, New York Central, Rock Island. 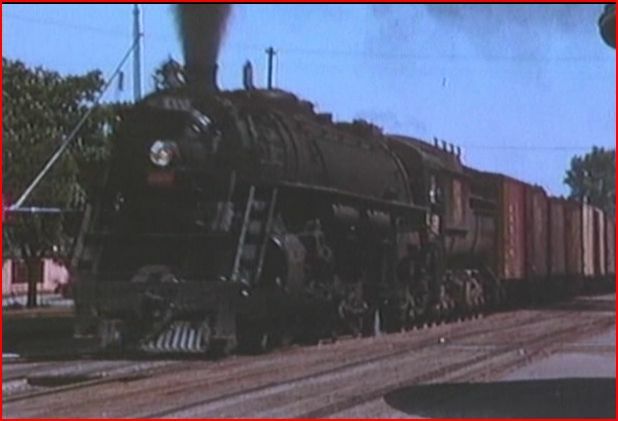 When it comes to vintage, 1950’s railroad films, Jerry Carson is among the best of the era. 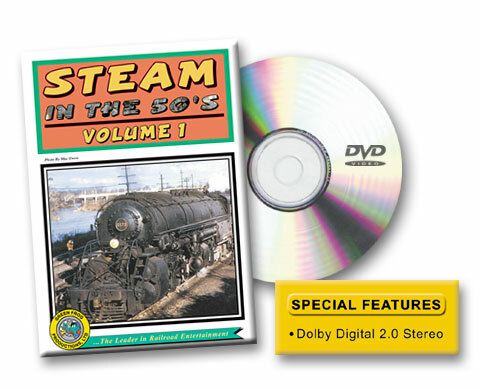 A fantastic array of many steam powered trains are seen in this program. Some screenshots will demonstrate the actual cinematography. Green Frog is well-known for maintaining high production standards. Excellent in most areas, this collection features: fine editing, nice audio and crisp narration. The show has a quick pace. Local freights with short trains are present. 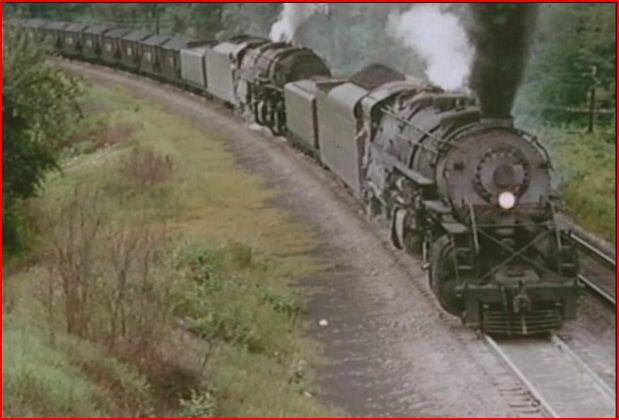 Big, mainline steam locomotives, haul the road freights. Passenger trains are viewed with heavyweight cars. There are eleven chapter selections, via the next button on your remote. No maps, they are not needed anyway. Some railroads have additional coverage, as noted. Other lines, ex: C&O- are just a couple of shots. All of the scenes are competently filmed. Chicago & Northwestern heads up this wonderful program. A good supply of steam is found. CNW is already using some of the first double decker passenger cars. Coverage is west of Chicago area, plus Green Bay! Grand Trunk Western has an excellent chapter. Mostly shot east of Chicago. Great freight action. Watch for the F7/ F3 diesels in green and gold. No worries, the other GTW locos are all steam. Chesapeake and Ohio, is a hard to find steam era railroad. Unusual pair. What happened to our quality control on some of the black and white footage? Minus 1/2 star for a handful of these pink scenes. New York Central and Rock Island are like this. Norfolk and Western has some double headers in West Virginia. See some Y class pulling some heavy coal trains, with a Y6 pusher engine! 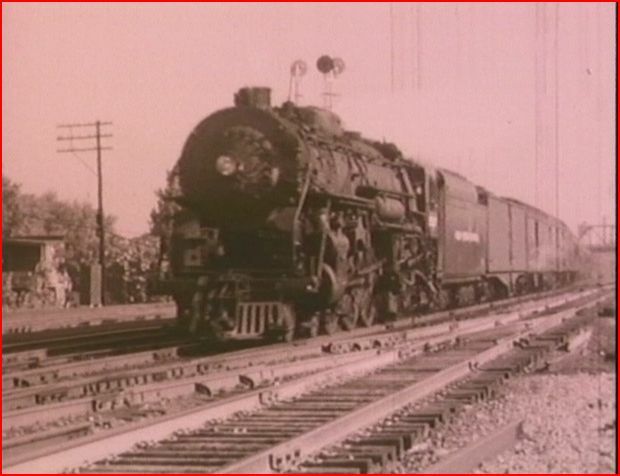 There are 0-8-0’s that have the strong N&W appearance. Rare 4-8-2 streamlined, K-class steamers, that closely resemble the famous bigger J-class power. Many trains are viewed on the N&W. Passenger action too. This busy and plentiful N&W chapter is a highlight of the show. Jerry Carson has some interesting camera viewpoints. The doubleheaded pair at the front is also filmed from this hillside. Easily could have included over a dozen different screens of Norfolk and Western here. This chapter alone, is worth the price of admission. 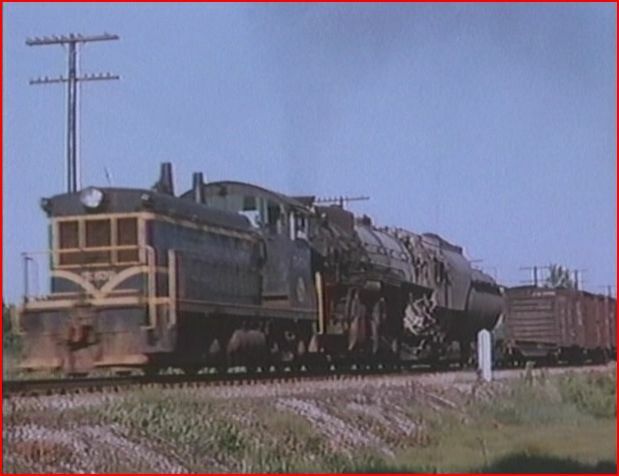 Canadian National and Canadian Pacific are shown, with a nice assortment of steam. They have older small power, also shiny modern steamers. Check this mint condition 4-6-0, with a build date from 1910. Yes, Canada has interesting power in the 1950’s. Illinois Central also provides much fine action. 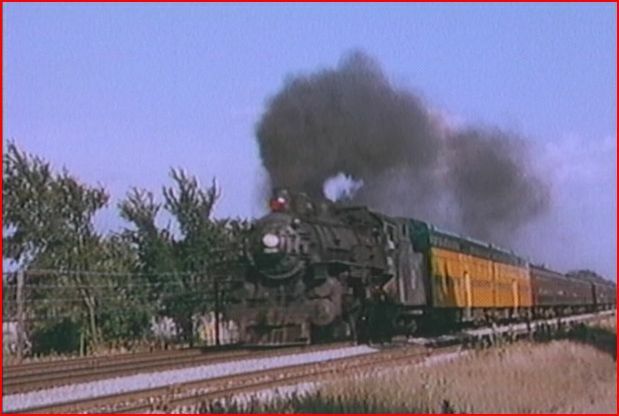 Classic trains around Kankakee. The 1457 is paced from Route 45. 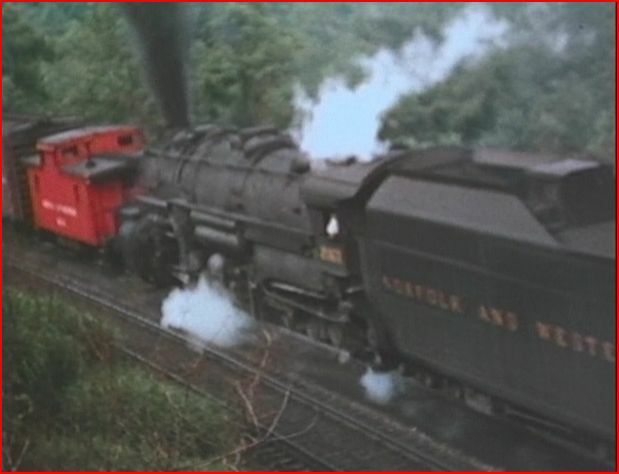 An occasional first generation diesel will sneak into a few scenes, in random points of the show Just like real life, back in those days. Freeport is another ICRR location, with the yard and facilities in the background. Illinois Central meat train. A Mountain type, moves the high priority train at a brisk pace. Olympia Fields is farmland, in the 1950’s! Many various IC trains pass the busy Winery Road location. Some high priority meat trains are seen at Freeport. Chicago has even more IC. New York Central has trains running on the IC trackage. The period freight cars are a treat. The Illinois Central feature is another great, extended chapter. 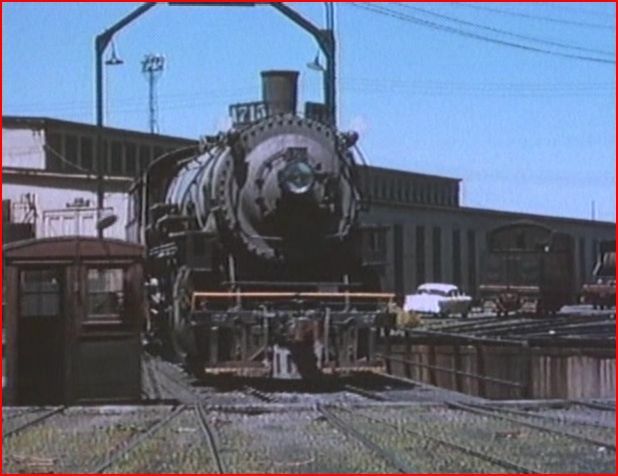 Pennsylvania Railroad is viewed on it’s West End. Indiana hosts this steam parade. Slow speeds give some sweet views of the varied PRR trains. Northern Pacific. Heavy Mikado at a roundhouse, with turntable spin. Little bit more of NP. 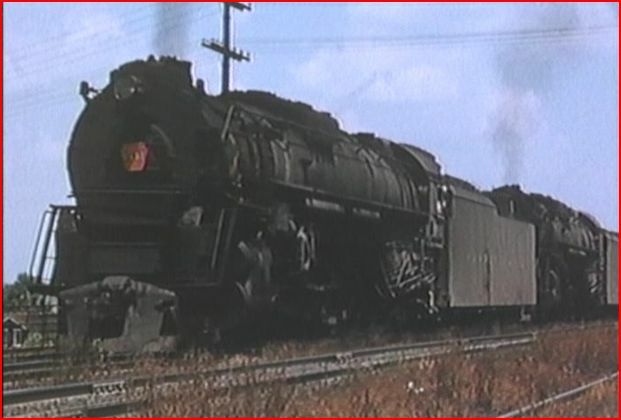 Missouri Pacific steam ended in 1955. 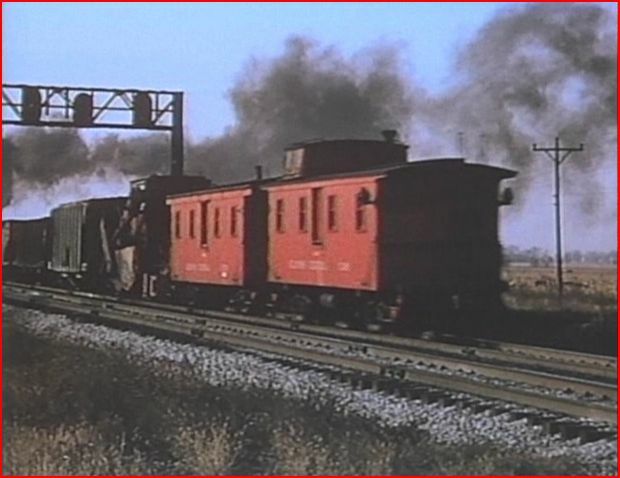 Jerry filmed some MoPac steam near St.Louis. 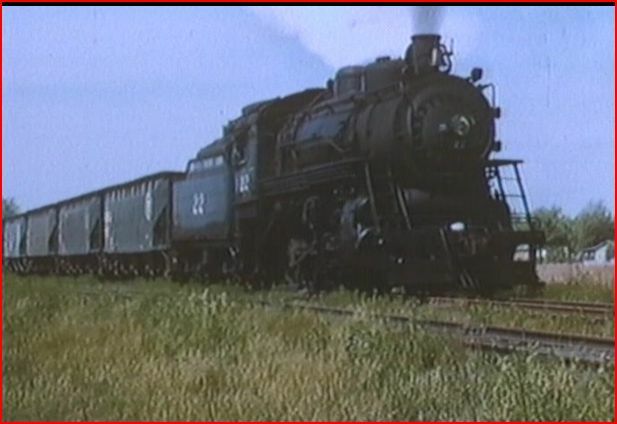 What is about Missouri Pacific steam engines? They look exactly like a beautifully designed steam locomotive should appear. 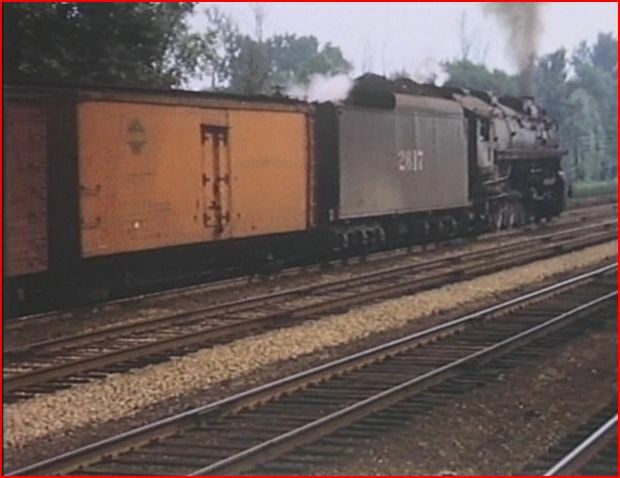 Baltimore and Ohio has some of it’s big league steam engines operating near and in Chicago. B&O fans have plenty of freight and passenger trains. B&OCTRR has an 0-8-0 at work. T-1 class Mountains pull some freights. Doubleheaders are included, in a cool sequence. A memorable look at the B&O. The show is mostly color. Some brief black and white footage rounds out the presentation. Some of the black and white: New York Central and Rock Island,and a little more- have some garish pink overtones, yuck! Actual recorded steam sounds augment the show. Concise narration outlines general locations, locomotive info and some train operations. The steam audio is used frequently. Steam in the 50’s is a classic show. Action packed, this will be highly enjoyable trainwatching for everyone! 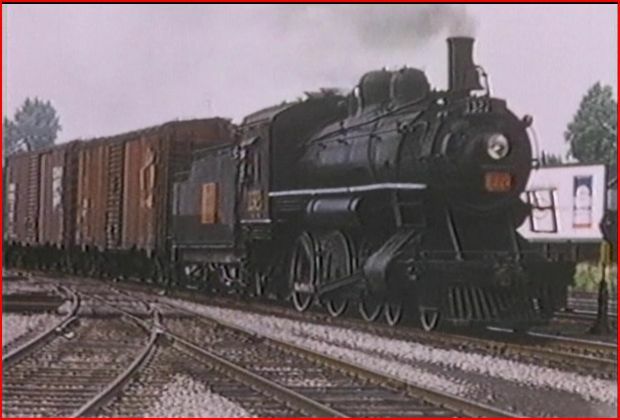 This entry was posted in ATVR Reviews, Green Frog Prod., Steam Train Reviews and tagged American Train Video Reviews, B&O, C&O, Canada, Chicago North Western, Chicago railroad, Grand Trunk, Milwaukee Road, new releases, New York Central, Norfolk & Western, Pennsylvania, Railroad, Rock Island, Steam, Steam engine, steam train, Train DVD, transportation by William J. Hudson. Bookmark the permalink. Excellent program, and one of the earliest programs I ever owned. It does suffer from the occasional flub Green Frog’s scripts will have; i.e. 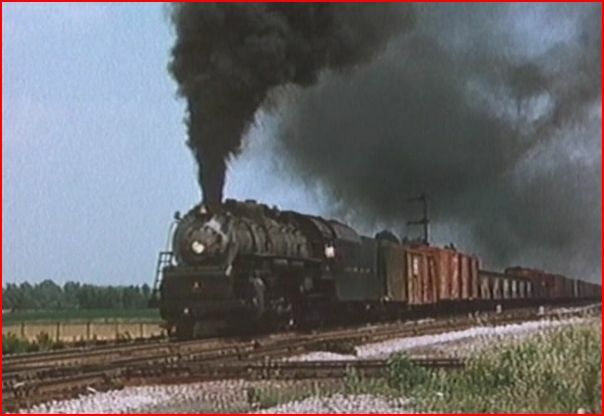 calling and Illinois Central 4-8-2 (of which there were many) a 4-8-4 (which I.C. never owned). One note; the streamlined N&W K class were 4-8-2’s rather than 2-8-2’s. Yes, Plenty of shows from everyone, can have an error. I don’t bother with a missed identification or two. As there are often a high volume of locomotives on many programs, the general accuracy is very high. There are plenty of diesels to be corrected in many producers shows, as well. Have made a few errors myself, and made the corrections. Out of 200 shows, the percentage is negligible. Decided from the start, I wasn’t going to nitpick an occasional mistake. However, if a script is a careless one, that would be in the review.